Hungarian studio Budapesti Műhely has restored the interior of one of Budapest's oldest bathhouses by replacing the vaulted walls of the warm water hall and shower room, leaving the bubble-shaped backs exposed (+ slideshow). The Rácz Thermal Bath was first constructed in the sixteenth century and extended 300 years later, when architect Miklós Ybl added the newer romantic-style bath halls and connecting shower corridor. Parts of the building were destroyed in World War II and the architects decided not to rebuild the brick walls behind the new vaults, instead leaving them exposed so that visitors can see the curved structures lining the hallway. 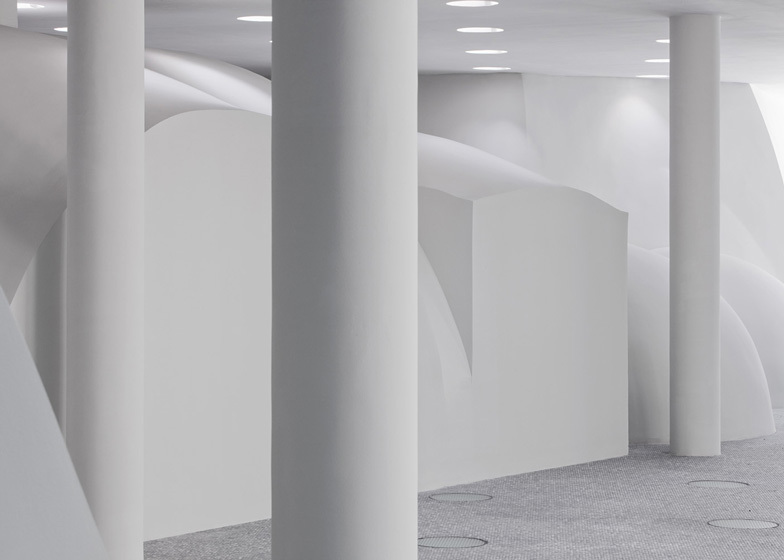 "As a result of our method, the richly formed interiors have been renovated by the architectural tools of their times, but the halls have received frivolous shapes never seen before," explained architect Tamás Dévény. Other new walls have been created with transparent glass to maximise views through the building. 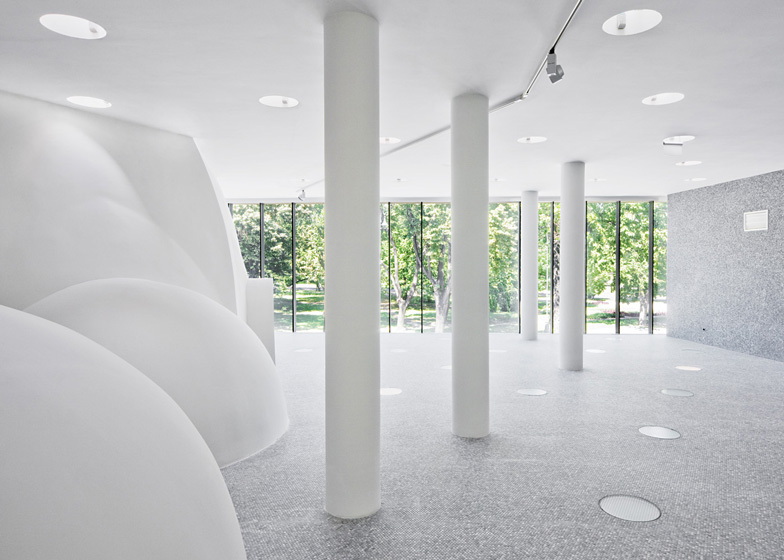 The architects noticed that round skylights are a motif that unites the different periodical styles of the rooms, so added more to the renovated spaces. 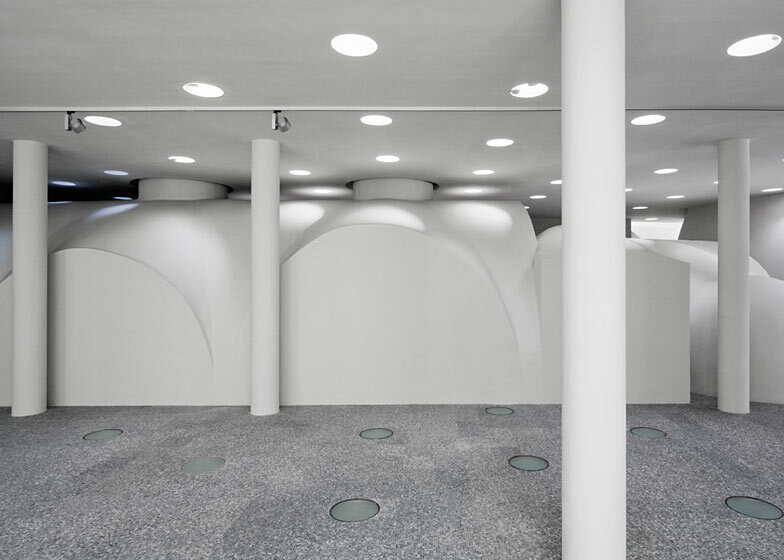 "Through these holes both the sunlight and the artificial light can reach the building’s lower levels and the different floors can cause strange light effects to the other floors above or under each other," said Dévény. Despite the contemporary additions, Dévény says they still used traditional building techniques. "There is no electrical light, no heating system or mechanical ventilation in the Turkish bath," he said. "Also the water pressure in the Ybl Bathing Halls is at the same level as it was possible to make in 1865." Other baths we've featured include a Jewish bathhouse in Mexico and thermal baths in Switzerland. Routed back to the 16th century, to the Ottoman times, when the central and southern territories of the medieval Hungarian Kingdom was ruled by the Turkish Empire for 150 years, the Rácz Thermal Bath is one of the oldest bathing building in Budapest. Heading towards completion, its renovation shows the original spatial appearance precisely how the different historical periods layered above each other and formed a complex arrangement through centuries. Led by the architectural firm Budapesti Műhely, the reconstruction paid attention not just to the building’s overall image, but also to the original technical inventions of the Bath. Situated at the foot of Gellért Hill, the Bath was founded probably during the ruling time of Sokollu Mustafa Pasha around 1560. The Turkish bath, the oldest part of the building, stayed fortunately unharmed when the long Turkish siege was over after the Battle of Buda (1686). As a result, the building’s ownership went for a while to the Austrian Kaiserlich Chamber and then in the 1860s to the Heinrich family. The wealthy family commissioned Miklós Ybl, a renowned architect of his time, to renovate (1864-65) and to extend the building with several new bathing parts (1869-70) in his romantic style. But before any extension could be made, the Heinrich family had to purchase the necessary ground floor areas in small plots one by one, since this part of Buda was a densely populated area at that time. This caused certain suddenness in the extension method and a highly complex spatial structure. Thus, the recent renovation had to solve not only the reconstruction of different styles, but also to harmonically unify the overlapping historical building parts with the new facilities. The building has been severely damaged during the World War II bombings and its condition became even worse due to the senselessly ordered demolitions of the 1960’s and to the decades of delay in the renovation process. Started finally in 2006, the work focused on the meticulous reconstruction of the original historical spaces and also of the Turkish era’s, the Baroque periods’ and the 19th century civic world’s bathing experience. Therefore, the architects renovated not only the original use of materials and the ornamental motifs with an extra care, but also the showering, lighting and heating techniques, the water’s pressure in accordance with the original customs of the different bathing halls. Thus the different historical times will become really sensible for the guests after the upcoming opening. White vaults in the newly built circulation spaces - Designed by Ybl, the Moresque Shower-hall and the connecting Warm Water Cupola-hall were completely destroyed by the above mentioned demolitions of the 1960s. Rebuilding these connecting parts, the architects’ intention was to maintain an unharmed historical experience in the building, meanwhile clearly expressing that these walls are not the original ones. Therefore, they decided upon building a 1:1 scale model according to the original plans and using a thin concrete shell structure (with a15 centimetres width) instead of the old brick walls with the variable thickness and straightened external surfaces as they were made in the 19th century’s building practice. Thus, the end result shows the interiors of the spaces in the same way as they used to look; meanwhile the exteriors got such vaulted shapes that have not existed before. Transparency - The bath’s restored parts are joined by glass facades, corridors and internal spaces with glass walls. With this solution the several centuries old spaces received such an architectural frame that reveal as much as possible from the listed building’s historical values. 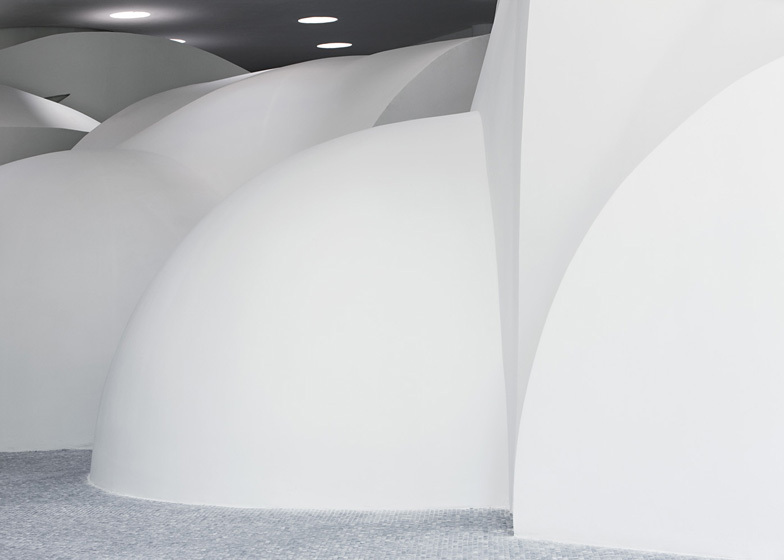 Giving a harmonic overall appearance to the building the architects used a recurring motif throughout the whole building to connect the different historical periods’ styles in the complex spatial structure: a rounded skylight. Acting like a kind of reinterpretation of the Turkish bath’s opeion, the rounded, glassed skylights are organised in a regular raster and occur in some parts of the new building parts’ floor-space. Location: Hungary, 1013 Budapest, Hadnagy Street 8-10.